Worm Composter - Make worm poo for your plants by composting with worms. Tips for composting with worms. Will a Worm Composter soon be living at your house? Worm farms are a tried and true method of turning junk mail and organic kitchen scraps into valuable worm poo, a highly prized fertilizer. Composting with worms keeps kitchen scraps and junk mail out of landfills and produces a valuable product - worm poo. For kitchen scraps and junk mail, a worm composting bin is a great tool that saves you money and the Earth from an ugly treadmark. Worm farms convert things that normally get thrown in the garbage into a nutrient filled growth medium cherished by gardeners in the know. Have you ever felt guilty about throwing uneaten vegetables and fruit away because they've spoiled before they got used? Feed them to the worms. You may not be eating them yourself but you're not wasting 'em either, and, in a roundabout way, you're still getting the nutrients from them. And what about all the junk mail? Worms eat non glossy paper and cardboard too and that makes worm farms a great junk mail recycler. Below, we have lots of tips on starting worm farms and a video that'll show you the ropes. Not only do worm farms produce a superior growth medium for gardens, plants and trees, they produce more and more worms. Worms that can be used to start a new worm composting farm for a friend or you can sell them to budding worm farm enthusiasts or fatten them up for the lucrative bait market, a great project for a young entrepreneur. Start by selecting and washing your container - the more kitchen scraps your family produces the bigger the container should be and the more more worms you'll need. Make sure the container is relatively shallow, that light cannot penetrate to the inside, and that there are air holes in the upper part and drain holes on the bottom. The holes should be no bigger than 1/8th of an inch so that air can get in, liquid can get out, and the worms stay in the container. The container should sit on a tray that will collect any drippings. Also it should be covered by a lid. Shred a layer of newsprint, paper towel, coffee filters, cardboard egg cartons, straw , hay, coconut coir, or cardboard into the bottom of the container and spritz it with water to dampen it. Not too wet, the kitchen scraps you add will contribute to the moisture. Add kitchen scraps and spread around. Peelings, rinds, leaves, cores, cobs, pulp from a juicer, coffee grounds, tea bags, egg shells and the barely recognizable stuff you find in the refrigerator. A little dirt or compost sprinkled over the kitchen scraps will get your worm composting project off to a good start. Now you can add the worms. Some worm farmers leave the mixture to sit for a week or two and then add the worms. One more layer of shredded paper or cardboard over the whole thing and another quick spritz with water and you're done. Place your worm composter in a dark, cool place and wait for your worms to start munching their way through it all. Keep an eye on things to make sure your worms are happy. Organic plant matter and non-glossy paper are the mainstays of worm farms. Vegetable and fruit matter, egg shells, moderate amounts of bread, cereals and pastas, and paper products such as paper towel, junk mail, coffee filters and tea bags are great kitchen materials for successfully composting with worms. Even hair, nail clippings and vacuum cleaner dust are welcome. Coco coir, straw, hay and well rotted manure (from herbivores only - cow, horse, sheep, etc) also make good additions as bedding materials...in case you ever run out of shredded junk mail, paper towel, cardboard paper towel and toilet paper rolls, pizza boxes, egg cartons, etc. (soak cardboard before adding to worm bin). Worms have their favourite foods... and their not-so-favourite. Avoid large amounts of citrus peel, onions, garlic, hot peppers and non-organic banana peels. (Banana peels have a high concentration of pesticides - not good for your critters). You can and should, add them in small amounts, just not too much at a time. Never add meat, bones, fat, oily foods (including salad dressings and deep fried foods) or dairy products. As the "wormkeeper" all you have to do is provide a suitable environment for the worms. The proper food and the right climate will ensure a healthy, happy worm home. Think of where worms normally live - in the moist soil, where it's dark and cool. When the soil gets too wet the worms rise to the surface gasping for air and trying to escape their soggy home. Too hot and they seek a cooler environment. The same thing happens in worm farms. In a poor environment the worms try to get away. Worm farms function best in a cool, dark and barely moist environment. 50 to 75 degrees F is the ideal temp for worms. Keeping it in the basement or a shallow pit in the garden can help to keep your worm enclosure cool during hot summer months. How do you know when your worms are happy? They are active, reproducing, and show no inclination to leave their home. Red wigglers are the best type of worm for a worm composting project. Although other types of worms do the same job, red wigglers will do it about twice as fast. The little critters love kitchen scraps - they are a little picky though and citrus peel, onions, garlic, hot peppers and non-organic banana peels should be added only in moderation. Also, the red wiggler worms seem to tolerate the confinement of a worm bin better than other varieties do. Typical problems arising in worm farms are worms dying, worms trying to escape, too wet, too dry and too hot. By checking your worms daily and attempting to mimic the natural environment in which they thrive, you'll go a long way toward keeping your worm composter healthy and productive. If your worms are inactive, dying or trying to escape check the environment in the bin. If the bin is too wet, too dry or too hot, correct the situation sooner rather than later. Too Wet - Drain off excess moisture. Check drainage holes in the bottom of the bin. Add shredded paper or coir. Too Dry - Give it a spritz of non-chlorinated water or add juicy kitchen scraps...or both. 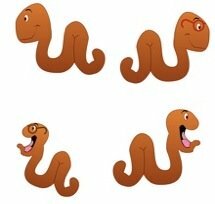 If all seems well in the environment department look at the worm's diet and the water you're using to wet the bedding. Are products such as dairy or meat being introduced to the composter? Too many onions, orange peels or hot peppers? Possibly, there are too many pesticides in some of the scraps. Ensure that the water you're using is free of chemicals. Worms like a PH that is low in acid, a half cup of garden lime sprinkled over the contents every week or so helps to balance the PH level. Here's a Fun Video on How to Set Up a Worm Composter. Visitors to our worm composter pages may also be interested in the following pages.